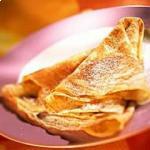 Every year, forty days after Christmas, on 2nd February, French people celebrate 'la Chandeleur', THE best moment (people usually eat them on Mardi Gras as well even if it's not officially the day of crêpes) to enjoy and cook these delicious sort of thin pancakes. Originally, 'La Chandeleur' is a religious celebration of the Christ's presentation at the Temple, 40 days after his birth on Christmas. 'La Chandeleur', or “Festa candelarum”, is, as its latin name suggests, the day of candles. Traditionally, lots of candles were lighted and brought from the church to home with care, keeping the flame alive. They were then lighten again to keep the evil spirits away. And, most important : as the last celebration of the Christmas cycle, 'La Chandeleur' is the date on which you have to remove the crib. But nowadays, 'La Chandeleur' is mostly a chance to get together with your family and friends, and eat the delicious crêpes ! Have you ever wondered why we eat crêpes at la Chandeleur ? It turns out that this type of pancake is said to embody the energy of the sun, as well as being a way of exorcising misery and starvation. I know, it does sound slightly crazy....but hey: it's tradition ! The first crêpe you make is suppose to presage good harvest. This is why you then have to keep it till next year's Chandeleur in your wardrobe. And if you want to be a perfect 'Chandeleurer', you can even put a Louis d'or (or any old coin) on the crêpe: It will apparently bring you prosperity. Where to eat "crêpes" in London? If you don't want to spend your time in the kitchen, go to one of the London best Crêperies listed by FranceInLondon. This is a perfect spot to break a visit to the Museums (Natural History, V&A, Science), as it is very close by, so you can pop there and pop back. The menu is extensive - both savory and sweet, the service efficient and friendly. Crêpe affaire is a place where you can enjoy freshly prepared crêpes whatever your craving, at any time of the day. A fun and relaxed spot where food is prepared in front of you. They opened their first shop in Hammersmith in 2004, and have opened new sites in many locations across London. The area of Hampstead would not be the same without its Crêperie. It is located at the corner of Hampstead High Street and Perrin's Lane. There are not tables to sit, just queue to get your crêpe (and people have done so for 20 years). The Simmons Crêperie is a new catering concept launched by husband and wife Curt and Raphaelle Simmons from Wimbledon. The idea is to propose an exciting alternative to traditional catering by offering authentic traditional Brittany galettes and crêpes, made fresh to order in seconds before people’s eyes and topped with their chosen toppings. Established in 2001 in the heart of South Kensington, it offers some of the finest crêpes in the world. Visit their sister restaurant: The Kensington Crêperie. However, you may prefer cooking your own crêpes, which is admittedly quite an exciting activity : avoid your dough going lumpy; slowly blending eggs, plain four, and milk... add a tad of vanilla essence, and my mother's secret ingredient : beer, and the dough is so delicious it's hard not to dive your finger straight into the stuff ( as a child I would sneak as many dips in as I could whilst my mother left the mixture to rest). Put the flour, salt, sugar in a bowl. Add the eggs and the yolks. Mix well. Gradually beat in the milk and the oil or melted butter. Leave for 2 hours. Check the mix and add milk or water to make a thinner batter. Lightly grease a crepe frying pan, and place over medium heat. Cook the crêpes one at a time and increase the heat under the frying pan. Turn over the crêpe when light brown on one side. How to fill your crêpes ? Crêpes can be filled with sugar, jam, lemon juice and sugar, mapple syrup or melted chocolate, etc. Quite simply, sweet or savoury: fill it with whatever takes your fancy! Pour ceux qui arrive sur cet article via Google. Café crêperie est très très moyen, du niveau café de gare. Crêpe affaire est infâme, les crêpes zone à peine reconnaissables et très mauavises. Je n'ai pas testé les autres adresses. crepe rotates in the air and falls flat on the right side - and in the pan(!) - and your wish comes true. If your crepe falls in the pan completely smashed or worse, lands outside the pan... Well this is bad new: ur wish will not come true. In wich case u can always explain that you are on training and that you will now make ur first crepe of the year! On va se régaler.... !! The Simmons Creperie is still offering last minute corporate or private pancake parties for Feb 2nd so do get in touch for a true, traditional, live crepe experience!